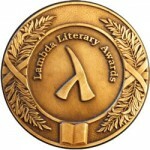 I am so excited to announce that my co-editor/co-consipirator, Andi Marquette, and I will be participating in the Lambda Literary Award Finalist reading in New York on April 24. It will take place at the Leslie Lohman Museum of Gay and Lesbian Art and will begin at 6:30 p.m.
Andi and I were so pleased to find out that we’re finalists for our anthology All You Can Eat. It’s really a great collection of stories from some wonderful writers and I’m very proud of the work we, and Ylva Publishing, did to make this an awesome book. I’ve done readings before and I’m always a bit nervous, but I’m particularly nervous about this one. I mean, this is a biggie. It’s kind of like being an actor and working your way up to an Oscar. I think there’s going to be a red carpet and everything! My biggest fear is tripping onstage and making a fool of myself. I’m going to have to just stop thinking about that before I jinx myself and make it happen. I hope to see some of you there and I’ll report back after the event. Happy Friday and have a great weekend.